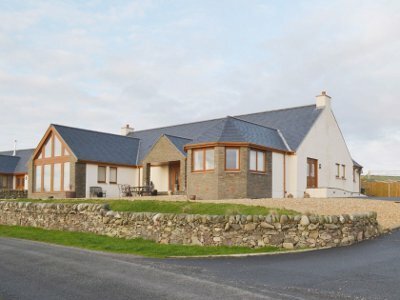 A lovely modern holiday cottage in Stairhaven, in south west Scotland, Millrosso sleeps 9 people. The location means you get some great views across Luce Bay - and there is a private hot tub to spend your evenings! Millrosso sleeps 9 people in 5 bedrooms. With the bedrooms being made up of a double bed with its own TV and en suite shower & toilet. Bedroom 2 is also a double bedroom, and has a shower and toilet en suite. Bedroom 3 is a single. bedroom 4 has a double bed. And, finally, bedroom 5 is a twin bedroom. The living room has a large TV, and a DVD player. There is a dining room which also has a TV. The kitchen includes an electric oven and hob, microwave, dish washer, fridge and freezer; with a utility room containing a washing machine and tumble dryer. There is also a family bathroom. Millrosso has central heating; with your bed linen and towels included in the price of your holiday. Wi-Fi is also available. Outside, Millrosso has an enclosed garden, with furniture to sit and enjoy those views across the bay. There is also that private hot tub to enjoy - perfect when the sun goes down. Millrosso and Stairhaven are located in a quiet part of south west Scotland, about 10 miles from the town of Stranraer. There are several towns and villages to explore during your holiday at Millrosso, with Newton Stewart, Dumfries, Portpatrick and Sandhead all being a short drive. The ferry to Belfast leaves from Cairnryan - about 15 miles from Millrosso; so you can even spend a day in Belfast. Or for those looking for some cycling action, "7 Stanes" is close too. The nearest pub, restaurant and shop are all 2 miles from Millrosso, in the village of Glen Luce. You can also just abandon the car for a few days, and walk along the edge of the bay; or take walks in the fields surrounding Stairhaven.